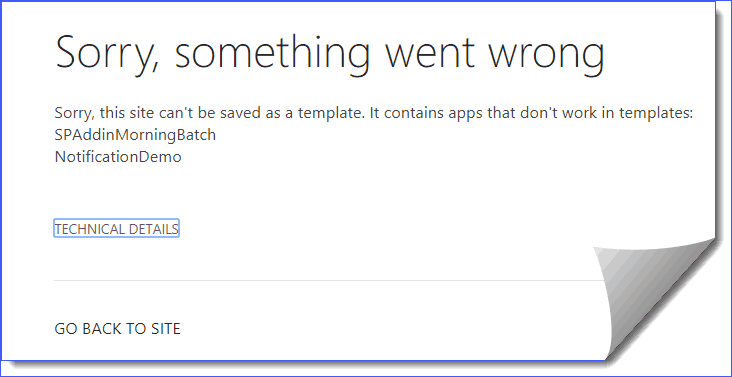 The error was coming while trying to Save site as a template in SharePoint 2013/2016, because there were two SharePoint hosted add-ins or apps are deployed to the SharePoint site. This issue actually comes when you have apps, that can not be saved as a part of the site template. For a workaround, you can remove the apps or add-in from the site collection and then save the site as a template. Once you have Saved the template, after that you can re-add the apps to the site in SharePoint 2013/2016. Hope this SharePoint tutorial explains how to resolve Sorry this site can not be saved as a template. It contains apps that do not work in templates error in SharePoint 2013/2016.